Returning for round four, 2016 Funko Walking Dead Mystery Minis Series 4 offers the next installment for TWD fans. The new batch includes a few exclusives, another motorcycle and a fan favorite figure debut. Series 4 consists of the standard Mystery Minis design, including large, white eyes. Rick Grimes and Michonne come equipped with their police uniforms and are joined by Bob, Daryl (and his chopper), Noah, Sasha, and Tara. Shop for Funko Walking Dead Mystery Minis Series 4 on eBay. Popular character Beth Greene makes her Funko debut. Also joining her as a new character is Morgan who is available in both masked and unmasked versions. In addition to the main group that has been revealed, there will also be several exclusive figures only found at Hot Topic. 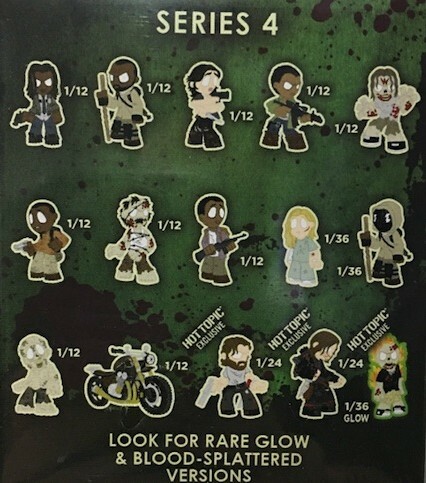 2016 Funko Walking Dead Mystery Minis Series 4 figures are issued in a blind-box format so they remain a surprise until opened. Each case includes 12 boxes. Full odds can be seen above, and several figures are tougher to pull, on average. WALKING DEAD MYSTERY MINIS - Funko Series 4 - NEW!! !